I like weekends that start off with no plans and evolve into fun, carefree days. That was today. Rory thought he was going to get up at 5:38, but all I had to do was tell him it was still sleepy time and he went back to sleep for another two hours. After we were all up, I sat around, drank a cup of coffee and watched some HGTV. Ryan was out for a run and once he returned, I decided I should do the same. It was probably the worst run I have ever had, but at least I did it. The kids were really into Kung Fu Panda so Ryan and I decided to watch Crazy, Stupid, Love. Not a bad movie, but a little too predictable at the end. By this time, we figured we needed to get out of the house so we loaded up the bikes and headed out to a nearby park to play. 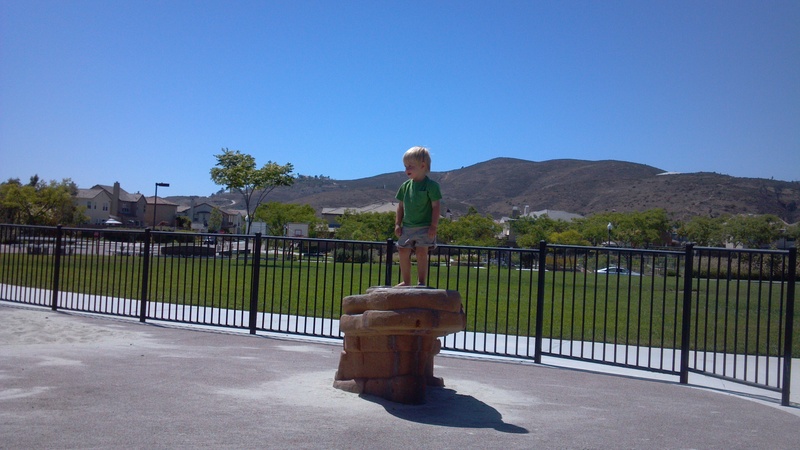 The kids played while Ryan and I recreated Citibank commercials on a rock wall. There are some things that Ryan and I just think are funny, but I’m pretty certain no one else would find the slightest bit of humor in them. Once we got back home, Rory was already in huge meltdown mode and crashed on the bed. Kamryn and I did some needlepoint. 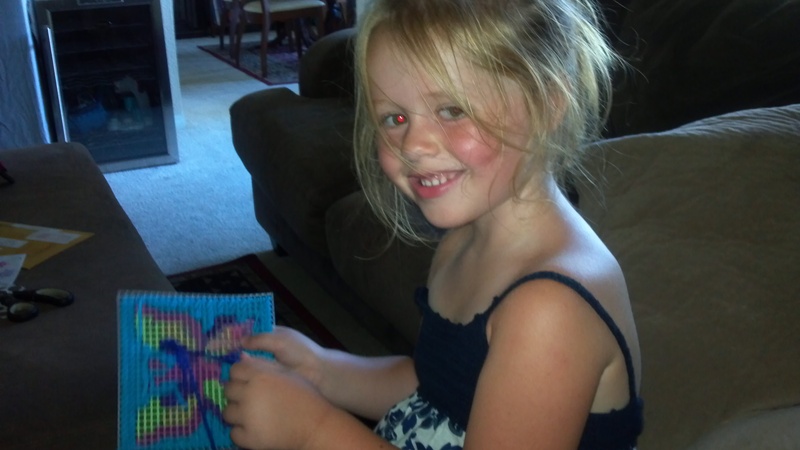 My mom sent Kamryn a little cross stitch project and she has been pretty patient with it. She’ll do about 10 stitches and then ask me to do it for awhile and then come back and do about 10 more. We’re almost done and yes, I probably have done about 80% of it, but she likes doing it. 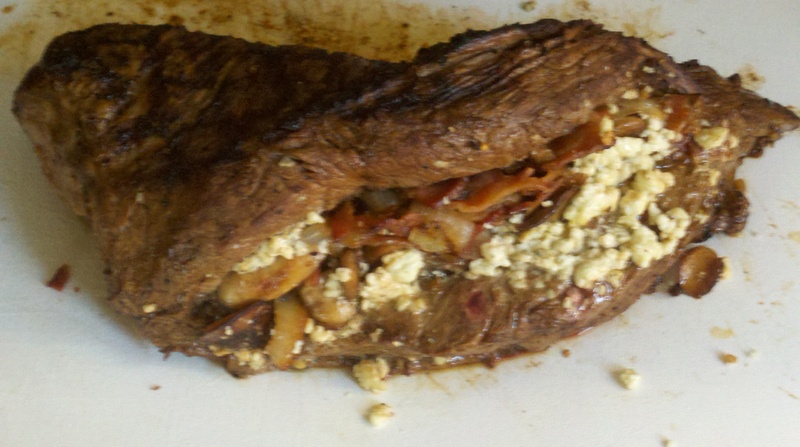 Ryan made a nice stuffed tri-tip for dinner with corn on the cob and asparagus. Now, I need to finish this post, refill my wine glass, put the kids to bed and relax with The Hangover II. Ryan Gosling and Bradley Cooper in one day? I think I do! This was Kamryn’s first 4th of July. 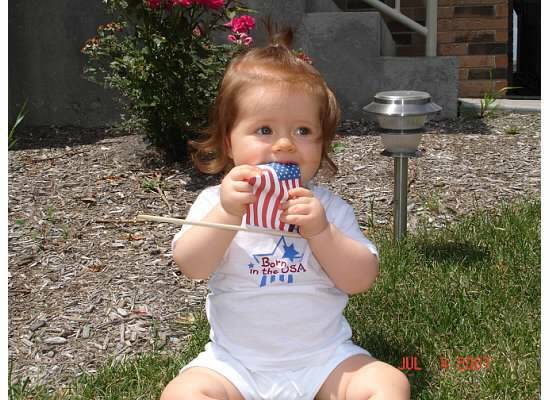 She was just shy of 9 months old and I thought I could pose her in our front yard with two little American flags waving next to her. As you can see, that didn’t happen. If I remember correctly, I printed those flags off on paper and stuck them to some chopsticks. I’m not sure why I taped the stick on the wrong side of the flag, though. I’m sure I had my reasons. I have always been a fan of Independence Day. Who doesn’t love some freedom? But beyond celebrating our great country, this holiday is the epitome of summer. Picnics, fireworks, parades, and parties. Growing up in the Midwest, I felt like 75% of the 4th of July’s were ruined because of rain. The firework show would be postponed and if it rained on the rescheduled date, they were usually canceled. That was always a real kick in the pants when you were a kid that just wanted to see some fireworks. We haven’t started a 4th of July tradition with the kids. I don’t know that we need to since as soon as they are old enough to go hang out with their friends, Ryan and I will get ditched anyway. I may try to bring back the tradition of taking a picture of the kids with some kind of American paraphernalia in the background. They are going to really appreciate that in 5 years – especially Rory when I try to get him to dress up like a Yankee Doodle Dandy. Don’t take the title too seriously. I’m not going to jump up on a soapbox and judge other mothers about anything. I just had a small epiphany today. Without Rory, my role as a mother would have been pretty easy and rather boring. Kamryn was and continues to be a fairly easy child. She cried as a baby, but really only at the appropriate times. She’s kind of whiny and a little sassy now, but other than that, she’s pretty good. Remember, her teacher last year referred to her as a dream child. I wouldn’t go that far, but I kind of like her. Today, Rory came out in the living room pointing to his nose with a big smile on his face. This isn’t strange. If he sneezes, he’ll seek me out only to show me he has snot hanging out of his nose before he finds a Kleenex to remedy the issue. I pointed to the box of Kleenex, but he remained still with the smile. I got up and took a good look at his nose and I didn’t see any snot, but when he looked up, I did see something in his right nostril. Rory had shoved a popcorn kernel up his nose. This is a first. I have never had to fish anything out of a child’s nose, ear, or any other orifice. Thank God. I remember my little cousin shoved a Tiny Tart up his nose when he was around 3 or 4 and I wondered what would prompt someone to do something like that. I have to admit, I panicked a little. 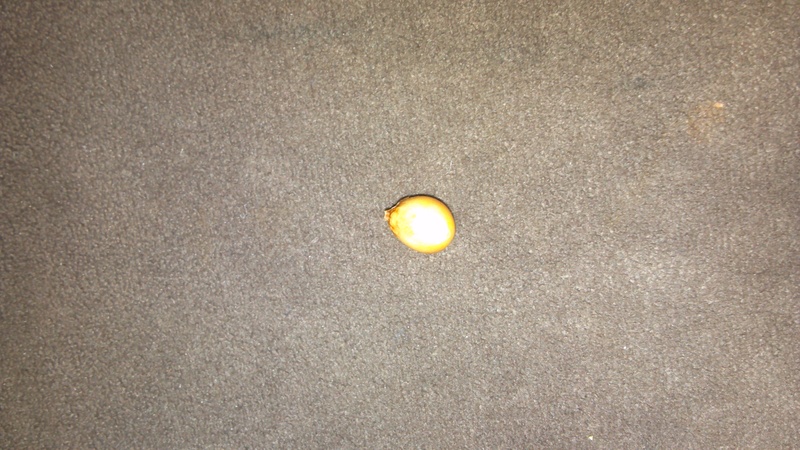 I tried to think if I should try and grab it with a tweezers or see if I could hook it with my fingernail. I gave it a go with my fingernail first and missed. I had him lying on the ottoman and I was holding the bridge of his nose to ensure I didn’t shove it further up into his nasal cavity. I gave it one more try and was able to scoop it out. I grabbed the flashlight and was trying to peer deep into Rory’s nostril to see if I could see any other kernels up there. I asked him three different times if he shoved any more up his nose and he wouldn’t answer me. It was hard to see up there so I had him blow as hard as he could into a Kleenex and then looked again. I couldn’t see anything up there so I think we’re in the clear. I told Rory he isn’t to shove anything up there ever again. He told me he wouldn’t. About 20 minutes later, I told the kids to get dressed for gymnastics. Rory came out completely dressed, but with his hair all over the place. He said he put hairspray in his hair and upon closer inspection, he sprayed nearly an entire sample sized bottle in his hair. 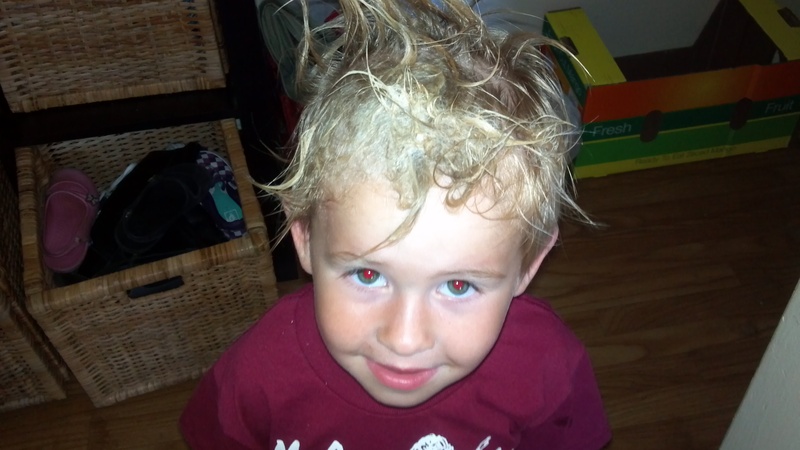 it was crusting on his forehead as well as matting his thin blond hair to his scalp. With only about 5 minutes before we had to walk out the door for gymnastics, I had to try and wash Rory’s hair which resulted in this. That’s shampoo – not hairspray, but it didn’t look much better. There is never a dull moment with Rory around. He is a constant source of entertainment and in near constant need of mothering. I think one of the worst “kid” things Kamryn did was color all over the wall when I was on a conference call. But, she did it with washable crayons. Thanks for making sure I earn my mom badge, Rory. Yesterday while perusing and stalking all of my Facebook friends and non-friends, I saw quite possibly the best fake product I have ever seen. Picture courtesy of Neil’s Facebook page via Ferrigno FIT. I showed it to Ryan and then immediately went to find out if it was real. The Abhancer is completely made up and as far as I could tell, no one has claimed this awesomeness! I was ready to pay up to about $25 for this just as a goof. Instead, I’m going to try and fashion my own Abhancer and then make Ryan model it. 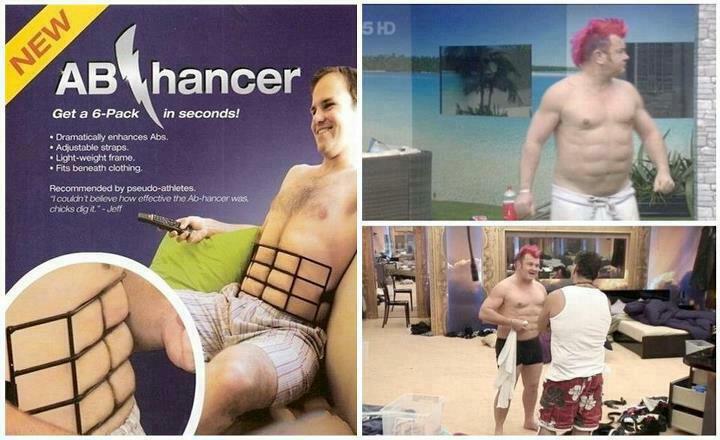 Of course he would just be enhancing his current 6 pack. Obviously, this looks pretty easy and cheap to make and I can’t understand why someone would put so much effort into making the prototype just for a funny ad. Abhancer Guy, I highly suggest you put some of these into production, because just like the testimony from Jeff on the ad says, this chick would dig it. 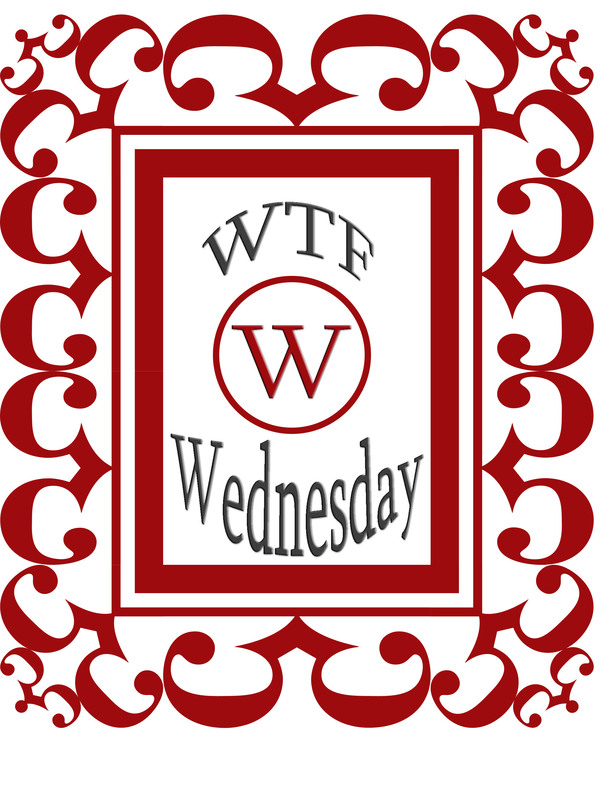 I will revoke my WTF Wednesday Award if Abhancer Guy delivers! It was finally here, the day I have been waiting for…my annual day at the fair! I won’t bore you again with what I think of fairs, but if you want to read about last year’s experience, you can here. 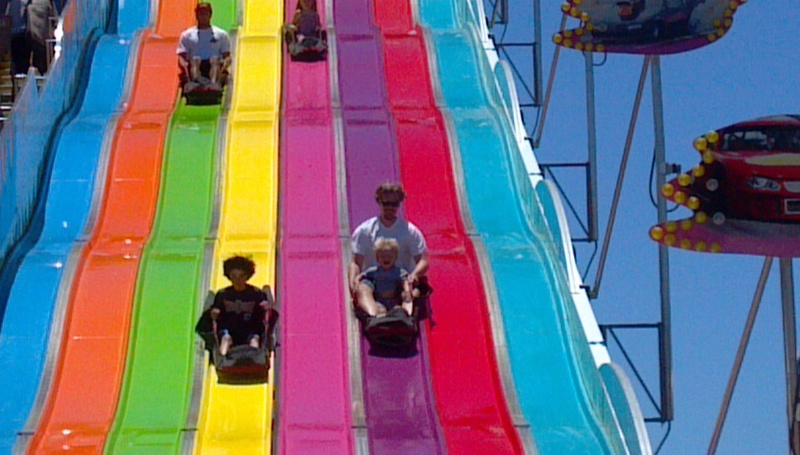 This year, Ryan took half a day off from work and we headed up to Del Mar to get our fair on. 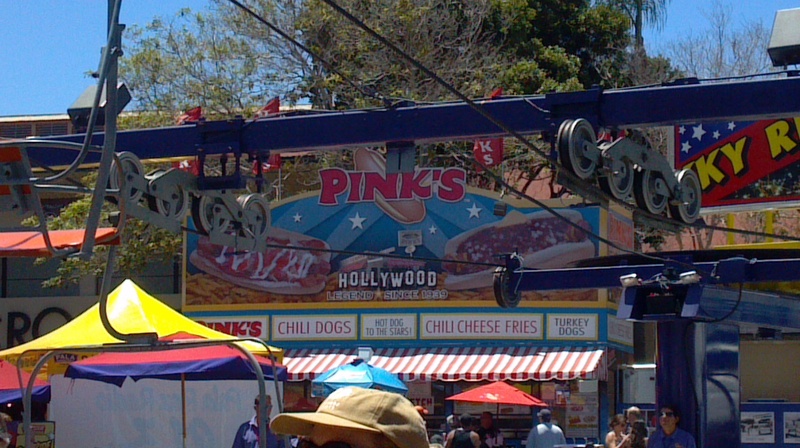 The theme for the 2012 San Diego County Fair is Out Of This World. Let’s just say that was a bit of an overstatement. I couldn’t believe how many of my friends said they were going to skip the fair this year. WHAT?! I have never even considered that as an option, until this year. I really wanted to be able to proclaim great things about our fair experience, but I just can’t. Everyone knows that you practically have to take out a small loan to go to the fair, but I also feel like for one day a year, it’s kind of worth it. First off we got the kids their food – hotdogs, fries and drinks for a grand total of $12.90. Actually, not too bad because we got 5 coupons for each meal to get into local museums and attractions. Next, Ryan and I decided on some fish and chips for our meal and we shared a soda. That came to $32. Not only did that not turn out to be that good, but we jumped the gun with our food purchase. When we turned the corner to find a place to sit and eat, there was a stand for duck tacos and Pink’s Hot Dogs had a stand. It was a rookie mistake. 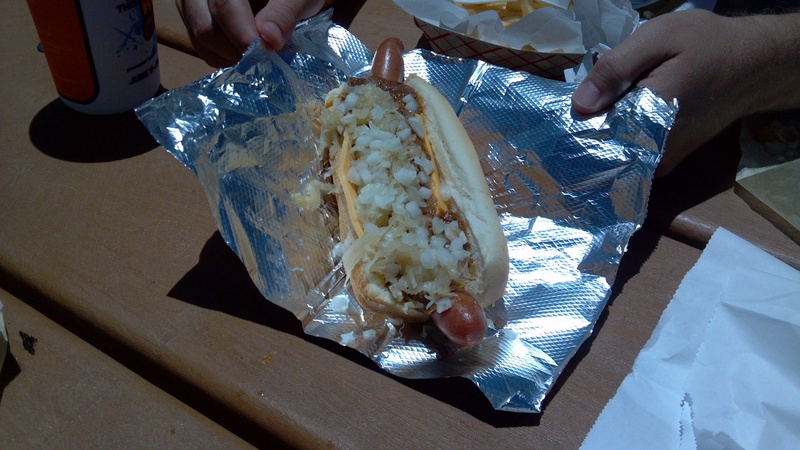 Ryan decided that we had to get a hot dog from there anyway so off he went to get a Rosie O’Donnell – 10″ Stretch Dog, topped with mustard, onions, chili and sauerkraut. Rosie O’Donnell apparently is a hotter commodity in San Diego than LA. Here, the dog cost $8, in LA, it’s $4.55. Next we decided to head down the midway to the rides. We weren’t going to ride a lot of them, but one of the main ones we wanted to go on was the huge Ferris Wheel. Last year, I took Kamryn and Rory on it, but this year, they changed the ride and each rider had to be at least 42″ tall. Rory is a whopping 36″. He probably won’t even be tall enough next year which is another reason to stay away in 2013. The total for the ride tickets was $28. I ended up taking Rory to the ride next to the Ferris Wheel which was a roller coaster simulator. There was no age or height limit so we handed over our 8 tickets and climbed in. There were two other boys that got in before they closed the door. Within 3 seconds of the ride starting, I averted my eyes from the screen to Rory’s head because I was going to vomit. Put me on a real roller coaster and I’m fine, put me in a pretend one and I’ll puke all over. After the disappointment of not being able to go on the Ferris Wheel and nearly losing my overpriced lunch, we walked around until we could find one more ride for the kids to go on. Kamryn loves big rides, she loves scary rides – a perfect ride for her would be a haunted house ride, which we found. Rory was scared shitless at just the sight of it. There was no way in hell he was going on that. We settled on the big slide. Once again, Rory was too short and had to ride with an adult and of course we were 3 tickets short. 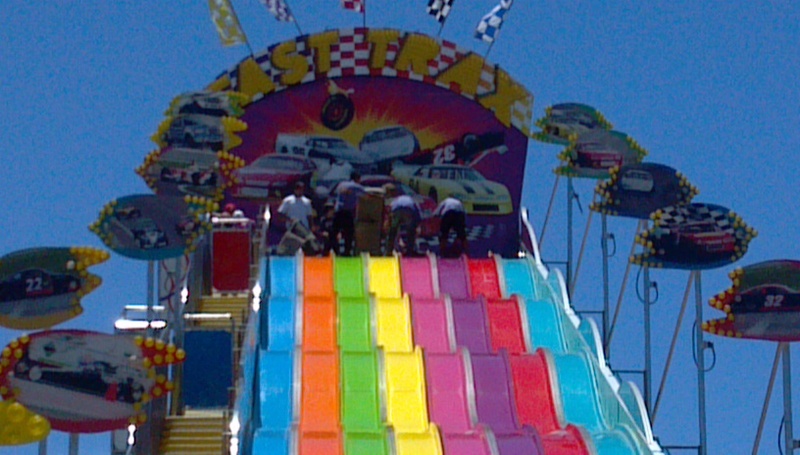 Another $2.25 and Ryan handed over our remaining tickets and they headed up to the top of the slide. At this point, we were at a bit of a loss at what to do next. We had made a quick walk through the livestock building when we first got there, but all they had in there were a bunch of lambs and cows – not even the prize winning steer and hog. You had to pay $1 each to see them. I don’t think so. We decided to head over to Our Body: The Universe Within exhibit. It was going to be an extra $7 for Ryan and I, but the kids were free. Plus, it sounded kind of cool. Unfortunately, there were no cameras or cell phones allowed, but it was pretty interesting. On display were actual human bodies and organs. Some were skeletons, some showed the muscles, there was one that was literally cut in half, others had the organs displayed inside the body cavity. It was really fascinating. Rory and Kamryn gave more than a few other exhibit goers their money’s worth by pointing out the bodies with penises. 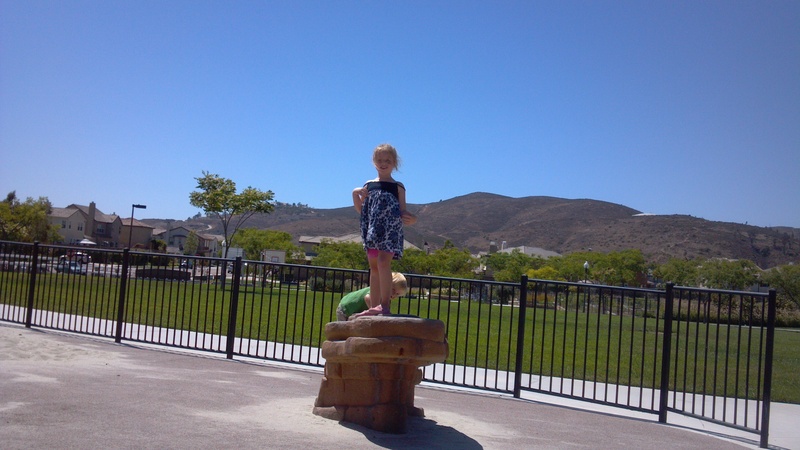 Kamryn just stood and giggled, Rory preferred to yell and point. And with that, our day at the fair ended. I’m not really that cynical, we did have fun, it just wasn’t as much fun as I expected. However, good things are coming down the pipeline, I just found out we’ll be in Iowa during the Iowa State Fair and I have a feeling I’m going to be in need of a redemption fair day! Ironically, the theme for the Iowa State Fair this year is, Nothing Compares. After my run to the store for pizza supplies yesterday, I made sure to grab the stuff for tonight’s dinner. I also went to Costco this morning to get some other supplies and decided to rearrange my whole scheduled week of meals with what I had on hand and what I picked up the last couple of days. Monday – Tacos – Regular, run of the mill tacos with the mix and ground turkey. Nothing special. Tuesday – We’re going to the fair! I’ll be sure to post about all the crap that we eat. Wednesday – We have a playdate with friends. Thursday – Patty Sandwiches – These are named after my friend, Patty who introduced me to these a few months ago. Take some good crusty bread and toast it, top it with a layer of pesto, mozzarella, tomato and then drizzle some balsamic vinegar over the top and top with the other slice of bread. It’s very simple, but REALLY good. 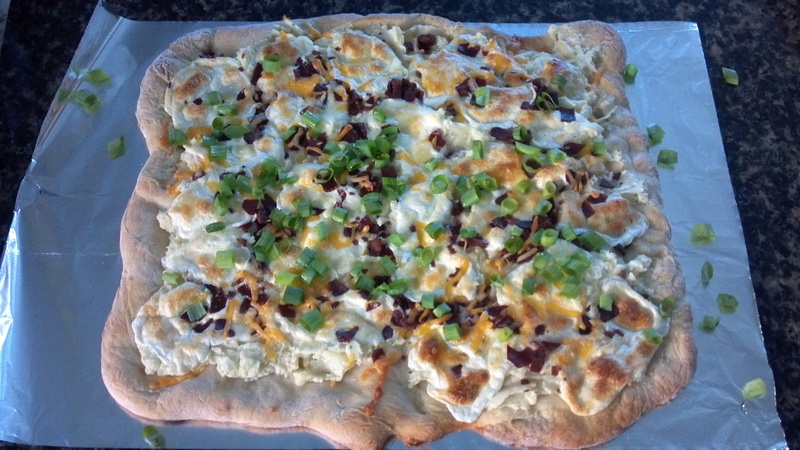 Friday – Costco Chinese Chicken Salad – If you have not had this yet, you have to try it. 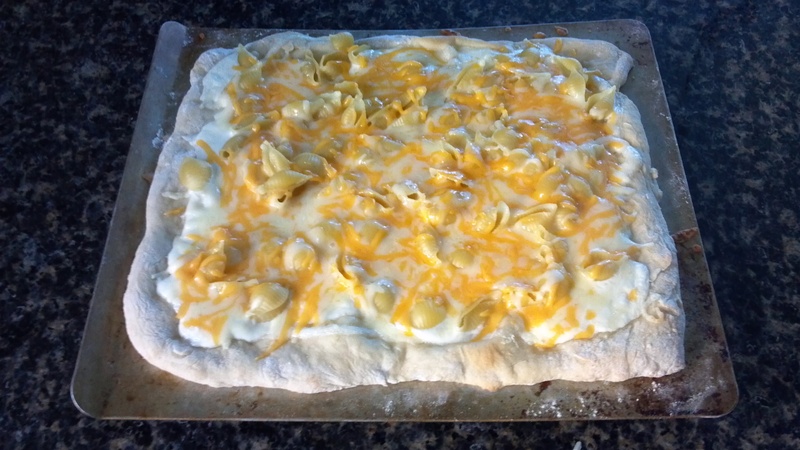 It will easily feed two adults and 2 kids. All you have to do is get the lettuce (one bag of the pre-washed stuff or cut up your own). Saturday – Pizza is on the menu, but I may end up switching that up since we had it last night and I just ate the leftovers for lunch. Sunday – We are going to a pool party at our friend’s house. This week is a little thrown together because of the activities we have going on, but if I didn’t plan something on the days we didn’t have anything scheduled, I can almost guarantee that we would be going out to eat on those days and that would make it a really bad dinner week.